Released this spring, Semiotext(e) produced this pamphlet as one of twenty-eight in a series representing this perpetually risqué publisher’s appreciable contribution to the 2014 Whitney Biennial. Similar strings of exhibition publication have appeared in the last years: Hatje Cantz, for dOCUMENTA 13, published a series of notebooks, 100 Notes– 100 Thoughts comprising facsimiles of existing notebooks, commissioned essays, collaborations, and conversations; or Artists Space’s Bookstore composed of publications selected by one hundred artists, writers and thinkers, each asked to select ten titles… (diced-up, but reminiscent of e-flux’s 2005 Martha Rosler Library). Obviously writers and books inflate the credibility of the nearby art. Part exhibition, but also something to read! Passing an eye over a few of the authors in the Semiotext(e) series—Franco “Bifo” Berardi, John Kelsey, Chris Kraus, Ariana Reines, Simone Weil—one’s in the presence of sterling grace, as this year’s model. Their content the summation of so many art crowd du jour hashtags. 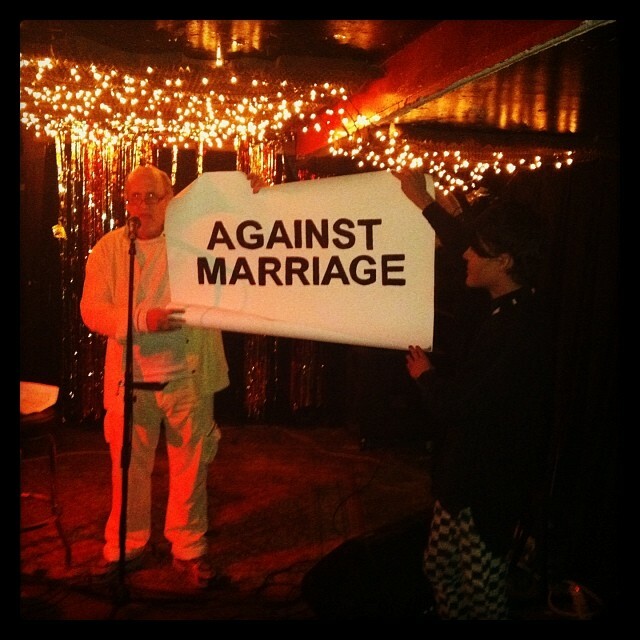 Against Marriage is as topical. A thorough and well-written argument for withstanding the platitudinous reasoning for advocating marriage, in particular men marrying each other. The texts offer a chord-striking range of insights, whatever family she’s descended from. And a stockpile of contrarian theory, Fourier to Foucault, readily available to unleash upon one’s liberal friends next time they’ve begun an enthused “isn’t life grand,” progress-toting, everyone-can-marry-and-join-the-army routine. However the pamphlet loses some steam considering the statistically short-lived sacred vow of today most resembles a Times Square tchotchke. Or remembering the aspects of otherworldly marriages, for instance, obstetric fistulas developed on too young to give birth bodies of Bangladesh or Congolese women—a condition following obstructed labor and stillborn pregnancy. The women who, seeping and stinking to high heaven, too poor or uneducated, are frequently ejected by their families, live or die in solitude. Begun as memoir, Against Marriage, brings the reader into Benderson’s world seen through the lens of brethren “bachelors,” “spinsters,”…”swingers,”… “flaneurs,” “Childe Haroldes,” “White Negroes,” “career women,” “anarchistes de droite”. Using descriptions of historic outsiders he paints a fairyland of anachronistic character—until the arrival of marriage. At which time the array dims, inverted from a dynamic state of refusal, to a reflection in polished obsidian. The status of unmarried, then, akin to Georg Simmel’s sociological category of the Stranger, fears the tight-knit town folk who in turn fear the ausländers. As well as the concept, derived from “Plato’s Pharmacy,” wherein Jacques Derrida, detecting Plato’s convoluted plot to absent the word pharmakos in his writings, thus preserving the exclusion of the term by continuously writing it out, concurrently toggles it to society (through absence). Marriage exists through ostracism, veiled in celebrating a team of two vs. the world. Benderson navigates through the Italian cicisbeo, Engels socialist dream of economic equality paving the way for something more or less like ideal love, and Simone de Beauvoir and Jean-Paul Sartre’s open relationship (which in retrospect, in light of private letters, just looks like insider trading). Each with their own alternative arrangements, none so much offer a clean getaway from the powerhouse of marriage as much as give Benderson a chance to stimulate some libidinal alternatives. A chimera crops up when Benderson asserts that the push for inclusion in the privilege of social and religious acceptance is distinguishable from legal entitlement. “As I have said several times in this essay and will say once more, it is the symbolic appeal of marriage that motivates people the most,” writes Benderson, “otherwise gays and lesbians would not have struggled for the privilege to marry and would have been just as content with firm protection for domestic partnership.” The generosity his copy gives to the illusion of a possible symbolic/material separation is proportionate to the eternal rebellion enriching capitalism’s struggle to remain relevant. In economic terms, while products and property exist, a system of signs will emerge as a currency gravid with the potential to index their movement. Capital, in one sense, is nothing other than a system for describing how value passes from one hand to another—necessitating an expansive, alternately stationary and evolving, set of symbols for describing individuating holdings. This, in any regard, is marriage. A symbolic as well as a legal portmanteau for maintaining love, repression, and libido. One of many potentially successful means for accumulating the gravity necessary to circulate for sale. Benderson seems to acknowledge as much: “Moreover, if gay activism had really been logical and more idealistic, it would have focused on the elimination of marriage and its sacraments as a legal entity—the separation of church and state, in other words—not to mention new legislation around health insurance, pension plans, inheritance and property rights.” But he doesn’t go far enough to make the refusal resonate as something graspable. Or at least not as far as he went in The Romanian: Story of an Obsession (Snowbooks, 2006) where he writes in the first person about a several year love affair with Romulus, a Romanian prostitute, who doesn’t fit the description of good boyfriend material. The latter portion of the book, following an initial joyful exuberance, comes with the accretion of Eastern European economic and cultural grit, producing in the narrator states far from equilibrium and causing him to experience bouts of ecstasy and degradation rarely encountered in English prose. I wonder, had the narrator been able to marry Romulus, would the novel have been longer or perhaps never written? What would Against Marriage have looked like if instead of so much protest, the pamphlet had been closer to the challenge of an unsolicited love letter? (which I suspect it is, despite Benderson donning a pariah garb). Why not entice people to couple as a means of struggle? By mismatching, through asymmetrical and non-reciprocal affections—lifestyle be damned—and consequently making certainly more interesting dyads, as well as impossible to maintain. Marriage under these situations stokes misunderstandings and asks the question, when knowing another person unlike one’s self, what sort of duration will ensue in this fait accompli before relations are torn asunder? Of course marriage is old hat, but not wearing it won’t pull down the system. I suspect with online dating (OkCupid) and GPS cruising (Tinder and SCRUFF) what is occurring is far more ensnaring than tying the knot. The mediation of ever more subtly inserted technologies of co-created desire enacts the latest phase of designed living through algorithm. The ennui of seeing everything one can ever know to want is just another essential battle for attention.